I try to always be honest with you but there is one shame I have yet to divulge. It’s a shame so bad you may never look at me the same way again. Much worse than feeding kibble or only owning one collar. Worse even than my addiction to Hell’s Kitchen. I don’t always pick up Shiva’s poop. I know, I know, I know. But please, before you shake your head in disgust and vow never to click on this blog again, please hear me out. Shiva and I walk through a lot of forests. Because we don’t have to worry about deadly snakes or poisonous spiders, I usually let her roam freely through the trees. It’s our favourite way to walk. Me on the path, she jumping over logs and tearing through the brush. When I picture my happy place, this is what automatically comes to mind. She always keeps me in sight and her recall is now solid enough I don’t worry about her taking off. Sometimes on these forest adventures is when Shiva realizes she needs to, uh, evacuate her bowels. If she happens to be on or near the path, I always pick up the poop she leaves behind. That’s why I always have bags on me. I don’t like stepping in poop anymore than anybody else. Also, I know that if I’d like to keep walking my dog in these places I need to be responsible. I don’t want to be the person that ruins it for everyone else. A dog park in the city has already closed for this exact reason. However, if Shiva is way way way out in the thick of the brush, where there are many stumps and branches I am bound to injure myself on, my scooping policy slides a little. Is anyone going to be bothered by it anyway? I know. Bad, lazy dog owner. Last Friday Go Pet Friendly wrote a mind-blowing post about dog poop. The authors of the blog vowed to not only always pick up their own dogs’ leavings, but to pick up the poop of dogs they don’t even know. While I don’t get creeped out by Shiva’s poop, the idea of touching stranger poop definitely makes my skin crawl. If these people can do such a brave thing in the name of responsible dog ownership, what does that make me? So it’s time to make my own vow. I am not sure I can promise to pick up stranger poop – baby steps – but I promise to always crawl through the twigs and over the fallen logs to pick up Shiva’s poop. I am a changed person now. And it’s all thanks to the poop fairy. Just so you don’t spend all weekend hating me, here is a short video of my dog being cute. We all deserve second chances, right? Does flinging my dogs’ poop into the woods behind my house equate to “picking up my dogs’ poop”? I figure the deer, squirrels, and turkeys’ poop is there, so why not add some….I’m going to hell, aren’t I. So you spent the past year or so writing all kinds of cool stuff and posting adorable pix and videos of Shiva just to toss dog poop in our faces? Oh, Kristine. My husband and I have had this debate. He’s inclined to leave it behind. But I read that dog poop left in wilderness areas can introduce new parasites to wild animals so it should be managed. In resources about “leave no trace” camping, people are advised on how to bury their own waste. I take the same approach with dog poop when we’re walking in a very remote area. So maybe you can carry a little trowel instead of baggies and bury Shiva’s contributions to the forest ecosystem. BTW, I just love Shiva’s white feet. It’s fertilizing the forest. How many people are likely to step in her poo off the beaten trail? I’ve written about the poop problem on my own blog; even at the dog park, if I’m too far from where he left it and he runs off before I get there, I can’t always find it! Now if we could do THIS with our poo (http://www.physorg.com/news203575072.html) it would all be worth picking up! I’m amazed you can let Shiva run off leash like that. A single squirrel sighting and I’d lose my dog forever. So stop telling us what a terror she is! I love Pamela’s opening statement. LOL! Kristine – I experience the same dilemma at our dog park, which is mostly wooded. 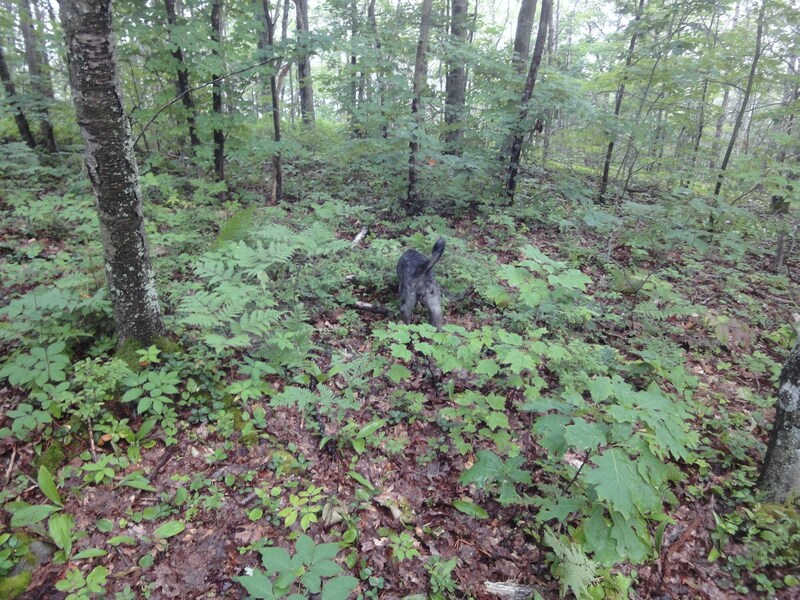 Jasper is a private pooper – he prefers to go DEEP into the woods to poop, where I can’t even see him. If I can get to it, I pick it up, but if I can’t (the snow is too deep to reach it, the overgrowth makes it impossible to even get at, etc.) I have been known to leave it. However, (this may sound like bragging, but true) I make more of an effort than some of the dog owners at our park. I also pick up other people’s dog poop at the dog park. It’s kind of a culture at our dog park to do so and the reason is that even if some of the people don’t those of us who value our dog park are willing to do what we must to keep it clean. It depends on where they poop. When they go deep into the woods where the coyote, deer, and fishers poop I don’t pick it up. If they poop in the field or on the trail I do. At the dog park I always do. We are on the same page as you, if it is on or near a trail, we always pick up, but if it is way out there, usually not going to happen. Love the video! You are not alone on this one. I am often out in the woods/fields with Luna too. And usually they are places that are not very public to begin with. I try and catch Luna before she has to go and “send” her deeper into the woods with a “go on” which is what I used to send her to the tall grass at my parents when she was a puppy. When I worked in town I got really good at picking up poop on sidewalks etc and then covering what little i couldn’t get up with dirt/leaves/sticks to make sure nobody walked away with poop on their shoes. If she poops near the trail or on the trail I pick it up. Wyatt is notorious for pooping mid walk in the middle of the path. My husband is still in denial about that but I have managed to get him to pick up his own dog’s poop several times. back when we went to dog parks I was very good at picking up her poop, and sometimes other people’s even as i find it obnoxious when people don’t even bother. You know what I also don’t like? When people let their dogs pee on all sorts of objects in the city etc, which makes it very hard for me to keep my Lunatic from peeing on them too. And since she likes to walk on 2 feet while he does so it can end up all over the sidewalk. Is it so hard to keep your dog from marking on lamp posts and brick corners??? Maybe that’s just too much to ask for, and I’m probably the only one that cares about this. Oh and cute video! I can’t wait till it’s cool enough to get out with the pups again. Maybe we will all just go hiking in the woods tomorrow anyway. I am forgiving you for two reasons. 1st and most important: Shiva is cute! Secondly, I do pick up poop (even other people’s dog poop) whenever possible. However, I’m sure all my dogs have pooped at least once 😉 and I didn’t crawl through poison ivy to pick it up. One of my favorite things to do is to hand people a poop bag (before or after picking up their dog’s poop) and say, oh so sweetly, “you forgot something!” Oh for a camera/extra hand to take pictures of the looks on thier faces! I do the same as you, if it is on the trail then yes immediately. But if it is in a wooded area, I usually leave it. Though reading above about introducing new parasites to the animal population is making me re think my policy. You know, if the girls were off leash in a forest I wouldn’t pick up the poop. But if they poop on or near a trail I pick it up. I do not, and will not pick up stranger’s poops. Yuck! Plus, the place we see the most poop is the dog park. I’d spend all my time picking up the stray piles!! My comment will echo Jodi’s above – in an urban setting, I pick up poop in all cases. Even if it’s a fairly densely green area in a park in the city. However, when out hiking or backcountry camping in the mountains, we have a rule: 5 feet off the path or more, and it gets left. Moses typically marches 20+ feet into the bush to do his business anyway. But if it’s near the path, we don’t leave it there. Like Jodi’s dogs, he’s on raw and his poop breaks down fast; I don’t see it as much different than the many animals that already go there. And when you’re following a path and come across deer/elk poop all over, I admit it’s hard to muster up the resolve to trek out into the forest to bag up dog do. Most frustrating is when you see a path covered with horse poop from riders who share the space. Though, I will admit that burying it – as noted above – is probably the most responsible option. But I have the same rule as you; no guilt or confession is warranted in my opinion. It’s law here to pick up after your dog, unless you are registered blind. Round the village I always pick up. Must admit to twice not doing so, as early on when I had Song she stopped right in the middle of a busy road. It was bad enough having traffic go either side of us, let alone attempt to pick it up. If we go up the farm track I always pick it up if it’s anywhere on or near the track. If she goes in the undergrowth, I’ll pick it up if I can physically get to it. Not sure even without a bad back I’d pick up a strange dogs poop. I use nappty bags, as they are so much cheaper than dog popp bags. Each of Song’s leads has a dog poop dispenser for the ones on a roll, which I keep as a back up should I run out of the nappy bags in my pocket. I let it go in the brush and woods but not on a trail or near a road. I do pick up others’ poop, too; I equate it to picking up litter – gross but a good thing to do when others are less thoughtful. I love Shiva off leash in the video and yes, her white paws are charming. Interesting idea about burying it. Then you wouldn’t have to carry it around with you. But you would have to carry a trowel. hmmm. I always bring a little tote bag along to deposit the deposits! I can’t stand walking around the neighborhood with a full bag of poo! I have to confess to being an pickerupper if the poop is easy to find but not it it’s done way off the track. Beryl doesn’t care where she poops, it’s usually just off the track. Frankie is more discreet and harder to locate! I’m often tempted to pick up after other people’s dogs but haven’t succumbed to that temptation yet! After reading the poop fairy post I might indulge myself … but I might not! I am a die hard poop-picker-uper. But, the dogs don’t really walk off leash. I will admit that when backpacking I did not pickup their poop, which is a no-no if you follow the leave no trace behind backpacking method. Ugg now I feel SHAME! But, I do actually wear a little backpack on all my walks with the dogs because Stella is the sort of dog that poops about three times on each walk and if I didn’t throw those bags in my backpack I’d look like the poop fairy. One plus about taking Lukey for walks is that part of his OCD is toileting… he will only pee in one spot in our yard, and poop in another. He WILL NOT go to the toilet any where else, so I don’t have to worry about poop (although I always have a bag tied to the leash). The girls will do their bit, and I pick it up. Our city is notoriously bad for dog poop outside of the CBD so I don’t bother with other peoples poop – there’s just too much!! Interesting thought though… My mother in law used to compost her dog poop. You have to be careful though, because if your dog has just been wormed it can have bad consequences for the earthworms. If it’s a day for confessions though… when my cats were still exclusively inside, I let my dogs eat their poop from the litter tray. I used biodegradable plant-based non-toxic litter… and the dogs would eat the cat poop if they got to it before I did anyway, so I let them. That’s probably really bad, but they liked it, LOL. Oh, and that is a point for the dog poop haters. AT LEAST IT”S NOT CAT POOP. Kita never goes far enough away from me to leave it behind – so I always clean up after her – and also I clean up after the numerous dogs who like to leave presents on my front lawn. As for leaving dog poop in the bush – the wild animals will not pick up anything they have not already been exposed to. If you are close enough to leave poop in their part of the world – they are close enough to people and dogs to already been exposed to dog bugs. And in reality – most pets to not have parasites – so there is none in their poop. Oh, I think we all have our little private moments of shame on the issue when we ran out of bags or some other disaster befell us and we left it behind. We try not to, but I admit that once in a while things happen, especially when my husband is along! He’s more a fan of burying it somewhere out in the woods than carrying it out! If I’m in the bush with the dog, I’m not picking up the doodie. If I’m on a well traveled public trail, of course I will. I don’t want to step in doo as much as the next person. Well, this is a crappy subject! I am in agreement with most. If it is in a rarely walked in area of the woods or heavy brush I leave it behind. Other wise I most certainly do and I have been know to pick up after others if it is directly in the trail or bagged. Seems a lot of people hear will bag and leave it, hopefully meaning to pick it up on the way back? Sometimes I beat them to it. I think i am the only weirdo who picks up my dog’s poo around this neighbourhood. People around here thinks its weird to pick up poo especially with a plastic bag.. *LOL* Educating is still a long way.. until the dog owners step on other dog’s poo. Hi Kristine. You and Shiva take nature walks and nature is forgiving when it comes to animal poop. So, I don’t think that your failure always pick up after your dog is such a huge deal. However, my twice-daily walks with my 2 little Shih Tzu boys is just around the neighborhood where there are many other dogs walking their owners. Most of us pick up rancid smelling deposits left by our canines but obviously not all. My dogs always spot these mounts which must smell heavenly to them and if I’m not quick enough, they will grab a mouthful. YUCK! One day I was in a rather bad mood which elicited agitation in my dogs. So, our walk that day involved an awful lot of pulling and tugging on their leashes. When it came time to step up to the plate, I deliberately did not pick up that which they left behind. However, when I got home I felt so ashamed of myself, I ran back to do the responsible thing and as penance for bad behavior, I also picked up a few other piles along the way which were left by other equality irresponsible dog owners. The universe will forgive us and so will our dogs. Now it’s time to forgive ourselves. In the two years I’ve had Charlie I’ve only not picked up his poop twice. one was on a very long walk after i ran out of bags, the other was deeper in the woods then I wanted to go. I feel like i’ve done a pretty good job, and a lot better then some people! You are such a shining example! I’m pretty good about pickup myself; the one place I sometimes slack is when the poop occurs in the midst of a snarl of poison ivy… I’ve spent enough of this summer itching and oozing already, with my beasts running through the stuff any chance they get and my own tendency to rub my face in their softness and slather them with kisses, even when I know better! We walk Cali off-leash in the woods too, and NO – we do not hike into the deep woods to pick up poop (I’ve had poison ivy on more that one occasion!) So I am right there with you! Shiva is SO CUTE . .love the video!! LOL! I had no idea that post would strike up so much conversation about poop. Reading though all the responses was really interesting – so many opinions about what’s acceptable when it come to picking up or not. I guess we just each need to do what we think is right and let our guilt be our guide. 😉 Hanna’s response really cracked me up … picking up extra poop as penance. Anyway, this little revelation is not enough to make me like you any less or stop reading your blog! You recognize therefore considerably when it comes to this subject, produced me in my opinion consider it from numerous varied angles. Its like women and men aren’t fascinated until it is something to do with Lady gaga! Your personal stuffs outstanding. At all times care for it up!